Sometimes you just have to push the silly button. Maybe that’s why it is time for the annual Pimp My Bookcart competition. 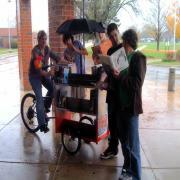 Last year’s winner was a Good Humor-themed cart created by welding students at Harlem High School. If you need to smile, check out all of last year’s winners. Two more smile makers come to you courtesy of Jim Averbeck and Kristin Clark Venuti. Jim interviews people at the American Library Association Annual conference every year. Then he and his minions go home and put together really fun videos. Here is one of this year’s videos, with fashion statements by authors, which in itself is a hysterical concept because we spend our days in our pajamas, most of us. And another, in which you can see how completely useless I am at game shows. Set… relax. It’s Friday. Summer is winding down. Life is good. Smile. Today’s prompt: pure silliness. Your character wakes up and can no longer speak any human language. Can’t write either. But she can still understand what the people around her are saying. And she can understand everything said by any animal or insect within fifty feet of her. Write a funny scene in which she tries to figure out what is going on. Build the absurdity of her situation by piling on misunderstandings and pratfalls. Make yourself chuckle. I loved all your links today! Thanks for making me laugh. And as for a T-shirt, I would definitely wear one with pride! Upon reading today’s prompt, I immediately thought I would fail. I didn’t give myself a chance. Instead, I loaded the rental van with a carload of family members. Made sure everyone got coffee and breakfast. Started three loads of laundry (much of which was ruined in transit by the airline), and then sent everyone (all eight people with eight different needs and wants) to the pool. From within the empty hotel lobby,I waved at my family members, put on my noise cancelling headset, and told my self-judgement to stay back in the hotel suite. Without thinking I wrote for thirty minutes; followed the prompt successfully (and to my surprise); and made myself laugh. I even think I’ve found a new character I want to follow: a sassy, sarcastic dragonfly. I almost blew right past this challenge since 15 minutes a day seemed so… meager. Where are the challenges about writing an hour a day? Or, two hours? Of course, I realized the obvious, which is that those challenges would never work. It’s the sheer do-ability of this challenge that makes it so magical. And it *has* been magical. Day 1 was fun, day 2 was a struggle… and, today, I woke up eager to check my prompt and get started. I have tapped into memories and images that surprised and delighted me. Thank you, thank you for giving me a reason and an inspiration to do this. My WIP is a bit stalled out at the moment. The beauty of this challenge is that it is opening me up to new ideas – possibly to new paths entirely, or ways to un-stall my WIP. Who knows what will occur? Each 15 minutes is a gift I give myself. Best wishes to you, Laurie, and to all the writers taking on this challenge. Tally ho! My character made chirping sounds when she cried and had green slim oozing from her legs when she chirped. The slim smelled like dill pickles. Her mother grounded her for making such a slimmy mess in her room. Even her dog growled at her when she tried to communicate with him. My fifteen minute writing turned into thirty with only a few paragraphs. I discovered my efforts weren’t very funny and I don’t know much about alternative methods of communication. It felt like I was wading in green mush somewhere harvesting letters from bean stalks. Need to broaden my horizens. BTW…..I miss you. I hope SOsososososo much I can see you on your upcoming booktour. I was a little down in the dumps today when I read the prompt, so I was more of a “Meh, I guess I’ll try it.” So I wasn’t really expecting much. But goodness. What random creativity (when I say random, you have no idea how much randomness was in it) came out from my brain. I found it funny. I don’t care if anyone else doesn’t. It means a lot to me 😀 And now, I’m in a totally different mood than when I started. I can’t write. I just can’t. It’s not lack of ideas. It’s not lack of time (definitely not lack of time). It’s not lack of space. I don’t know what it is. Have you ever seen the music video for “Flash Delirium” by MGMT. It sort of feels like that in a weird way. Maybe not the way you would expect. What do I do now? It’s not because I can’t. For some reason, I don’t want to. I still want to read and listen to music. I still want to eat. Do you ever get days where there’s no reason to write it seems? Even weeks possibly? Loved the links. Much needed as it sinks in that another school year is upon us. The book carts were especially fun as well as the interviews. Please get that “Librarian Rocks” clothing line;) started soon. Which reminds me I would be thrilled to have the “mad Woman of the Forest” tee shirt show up in my mailbox. This prompt scared me. How was I going to to this. But once I started I discovered my silly gene hidden inside. It will be something I can work on for the grand daughters. Happy weekend. I FINISHED my “Fear” piece. (I ought to find a better title for it…later.) But I totally took on the throat-squeezing reality of it and wrote what scares me. And for a couple of days I was pretty sure it was going to kill me dead. But I am happy to report that I am not only still very much alive and mostly vertical, I. AM. POWERFUL. This thing, this thing that scared me, has been so big I could neither live with it nor without it. It has been the definition of who I am against my will. But now. Now I own my life! Now I LIVE! Paste my picture here: “This is the true joy in life, being used for a purpose recognized by yourself as a mighty one, being a true force of nature instead of a feverish clod of ailments and grievances complaining that the world will not devote itself to making you happy. I am of the opinion that my life belongs to the whole community, and as long as I live, it is my privilege to do for it whatever I can. Alison <—who now is free to unleash the creative genius! Next PostNext Mad Woman in the Forest tee-shirts, anyone?